In a medium bowl, combine flour, baking soda and salt; set aside. Cream together white sugar, light brown sugar and butter (do not use shortening). Stir in slightly beaten eggs and vanilla. Add flour mixture until just mixed. Stir in vanilla chips, macadamia nuts and dried cranberries. Drop dough on an ungreased cookie sheet by small scoop or rounded teaspoon. Bake in preheated oven until cookies are just set, about 10 minutes. Remove from oven and let cool. Cookies will sink slightly. Variations: To make chocolate cookies, omit 1/2 cup flour and replace with 1/2 cup cocoa. To make refrigerator cookies: Roll dough into 2 rolls, wrap with plastic wrap and chill or freeze. (If you freeze the dough, thaw for at least 1/2 hour before cutting). Slice 1-inch slices; cut into 4 and place on baking sheet point up. For fancier cookies: Drizzle melted white chocolate on chocolate cookies and melted dark chocolate on the white cookie. Enjoy! 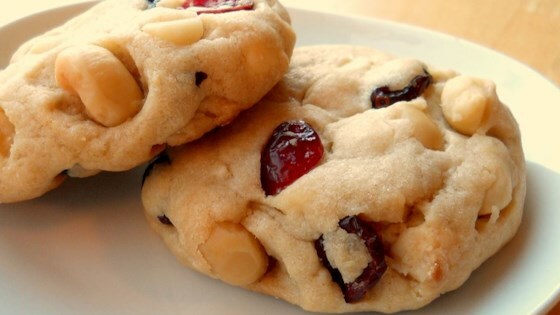 This is one of my all time favorite cookie recipes. Every time I make them, they disappear! I did find however that they take more like 15 minutes to bake. These are great! I will make again great for sharing. I made them bigger about 2-TLBS rolled into a ball which made a nice sized cookie. A keeper! YUM! I omitted the cranberries this go around and added more nuts and chips. Delish! I've tried other white mac nut cookies...these are the best!! !